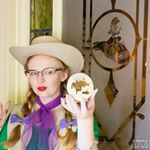 With so many Halloween festivities, fall Dapper Day (an unofficial day at the Disneyland Resort when Guests are encouraged to “step out in style” for a day at the park) really snuck up on me and I honestly felt like I had nothing to wear. But when I noticed the temperatures were going to be on the cooler side, and wanting to be different than the rest of the well-dressed crowd, I opted to pull out some of my nicer, more spiffy vintage western wear. I am overjoyed that I opted for this look as opposed to a dress or blouse/skirt combo. I was comfortable, yet still stylish, and got to showcase some of my favorite pieces from my wardrobe that don’t go out often. While I have loads of western wear, I tend not to wear the true vintage in fear of something happening to it. But for a laid back day at the park, it worked out very well. Not only did I get to see so many familiar faces, I met lots of new people, and I got to finally meet some readers and Instagramers in person! Which is always a treat! There was the added bonus of the Dapper Day Expo where true vintage and vintage inspired vendors sold their wares. I came home with quite the Match Accessories bundle, including this amazing Davy Crockett guitar brooch! I also scored two new to me vintage dresses, including a Swirl! You look superb in this outfit – I am especially envious of those pants! What a fun outfit for Dapper day! I’m sure you stood out from the crowds- in a good way! Absolutely stunning. I would love to wear Western outfits – but it’s already a lot to take for Germans to see someone wearing true vintage but wearing vintage cowgirl wear would be far too much. Everyone would ask me, if I’m part of an art projoct or a movie ….